The news is out about growth hormones, antibiotics, genetic engineering and similar practices infused into agriculture and food production processes. In light of that news, many are seeking the best natural remedies and alternative cures for whatever ails them. The unraveling of production practices and side effects also has impacted the pharmaceutical industry. The chain of innumerable side effects trailing the end of advertisements like an auctioneer broadcasts bids is enough to scare those who take their health seriously into a lifestyle overhaul. Not only did the Industrial Age fail to deliver on its lofty promise to heal faster and feed more for a lower cost, but efforts to deliver on this promise have been killing us. As a result, people are rediscovering that the basics of a whole-food, garden-fresh, home-cooked meal followed by an evening walk—which they may have experienced long ago at grandma’s house—is truly good living. Health-focused Christians know that in order to do what God has called them to do in His kingdom, they must be in good health physically, mentally and spiritually. Acknowledging that the body is a gift from God, they seek to take care of it is as part of good stewardship and a demonstration of the fruit of the Spirit. Although Christians don’t always follow the crowd, it’s important for the Christian retailer to discover how consumers in general are spending their money on health-related products. The U.S. weight-loss market totaled $64 billion in 2014 and is expected to grow in 2015, according to Marketdata Enterprises. In a fortune.com article, “Lean Times for the Diet Industry,” John Kell says weight loss market leaders such as Weight Watchers, NutriSystem and Jenny Craig show declining revenue year over year, with some showing as much as a 21 percent drop. So where is money being spent on weight loss? While “77 percent of Americans are actively trying to eat healthier ... only 19 percent say they’re on a diet,” according to a 2015 poll conducted for Fortune. This movement is about more than simply being skinny; it’s about being healthy—mind, body and spirit. 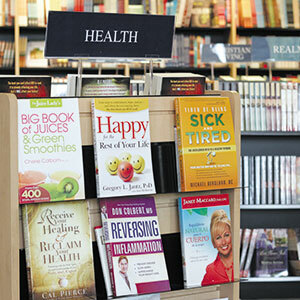 A 2012 HuffPost Healthy Living article highlighted the value of health-themed books. Dr. Don Colbert’s best-selling The Seven Pillars of Health, his “Bible Cure” series and similar titles have certainly influenced readers in a big way, reconnecting them to ancient biblical secrets of divine health laid out by their Creator. Best-sellers such as Cherie Calbom’s The Juice Lady’s Big Book of Juices and Smoothies and The Maker’s Diet by Jordan Rubin came about as a result of the author’s testimony of healing via prayer and natural health protocols. Books like these have given millions of readers the ammunition they need to fight back against sickness and disease—and win. Being aware of health trends is critical for Christian retailers who want to serve health-conscious customers. The Christian retail store located in a plaza or in a mall near a health food store can best capitalize on drawing these customers. But of course, each store that values health will want to carry some health-related products. Fasting, detoxes, cleanses, jump-starts and challenges—7-day, 10-day, 21-day and 30-day options. Expect to see similar themes from Christian publishers in January. For example, of Siloam’s four new titles, three will be focused on fasting and detoxing—The Daniel Detox by New York Times best-selling author Don Colbert, M.D. ; The Juice Lady’s Sugar Knockout by best-selling author and juicing guru Cherie Calbom; and Fasting for Life by debut author and researcher Francis Umesiri, Ph.D. The fourth release on the perennial topic of weight loss is by popular weight loss and fitness coach and Doctor of Physical Therapy Braxton Cosby and is called Fat Free for Life. “Fasting and diet and weight loss are the most popular categories in my store,” said self-proclaimed “health nut” Will Schremp of Discount Bible Books in Warren, Michigan, a suburb of metro Detroit. Schremp noted that his store’s customers are more interested in fasting and its connection to spiritual breakthrough related to issues like financial troubles than they are titles in other healthy living categories. Rick Warren, pastor at Saddleback Church in Lake Forest, California, understands this connection between body, mind and spirit and led his congregation in the weight-loss and healthy lifestyle plan found in The Daniel Plan (Zondervan). Co-authored by physicians Daniel Amen and Mark Hyman, the book shows readers how to optimize their health in five key areas: faith, food, fitness, focus and friends. The Evangelical Christian Publishers Association named the book the 2015 Christian Book of the Year. The book encourages Christians to value a healthy lifestyle integrated with their spiritual well-being rather than health for health’s sake. 1. Have local chefs teach cooking classes or food preparation demonstrations. 2. Host regular author signings and presentations. 3. Facilitate once-a-week fitness classes like Zumba or Pilates, or start a weekly walking, running or biking group. 4. Use Instagram or Tumblr to attract the interested younger consumer. Create health and fitness memes featuring some of your products or events, and flow them into the thread of viral hashtags such #meatlessmonday, #eatcleantraindirty, #greensmoothie, #eatclean, #healthyliving, #fitfam, #rawvegan and #fullyraw. 5. Sponsor 21-day detoxes and health or fitness challenges. Ask customers to sign up for these online or in store, capture their email addresses for future store news and offer a free e-book download of some sort in exchange. For weight-loss challenges, award to the winners gift cards or in-store credit for merchandise. Host weekly weigh-ins and a party at the end of the challenge. 6. Partner with local farmers and provide homesteading 101, gardening 101, pesticide tips and other such classes. This serves the farmers as well by increasing their exposure to your customer base. 7. Connect with chiropractors, naturopathic doctors and nutritionists for free health screenings, or have them teach a class on natural home remedies, infant massage and quick-and-easy, healthy recipes for the whole family. 8. Set the mood. Make sure that all the senses are engaged when you are hosting a special health-related event. When you have a new product to debut, have a demo piece that your customers can try. Use essential oils, peaceful music and well-organized displays to offer your customers an oasis of peace and joy in the midst of life’s rush. This will draw customers, especially during the Christmas season. 9. Partner with pastors and ministry leaders to host nights of prayer and healing. 10. Make sure you have a dedicated section for health and wellness. 11. Add a health tab to your store’s website. Post health-book author profiles and interviews as well as other health and fitness content. 12. Design endcaps and book table promotions during the “New Year, New You” promotional season that comes around every January. With a surge of empowered and informed consumers looking for whole-person health answers, Christian retailers have significant opportunities to draw them into their stores and make their buying experience transformative. Jevon Bolden is the former senior acquisitions editor for Charisma House Book Group, where she focused her acquisitions strategy on the publisher’s integrative health imprint, Siloam.